Visiting Auckland or Sydney over the next couple of months? You simply must go to the Pop-Up Globe. It’s one of the world’s two full-scale temporary working replicas of Globe 2, the theatre that for three decades was the home of many of Shakespeare’s plays and the company he wrote those plays for. One is in Auckland, the other is in Sydney. I had the great good fortune to see Taming of the Shrew a couple of weeks ago, and more recently Richard The Third. Next on the agenda is Hamlet. The pop up construction is very clever. The skeleton of the building is steel scaffolding – the sort you see on building sites. This allows it to be taken down, stored and rebuilt again. Each iteration has seen improvements in design and staging. 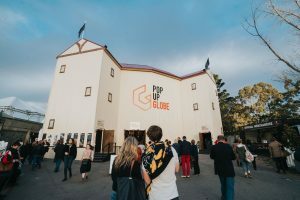 Pop-up Globe is a three-storey, 16-sided, 700-person capacity theatre. It unites cutting-edge scaffold technology with a 400-year old design to transport audiences back in time to experience Shakespeare’s masterworks in the space for which they were written. The theatre is constructed from over 100 tonnes of scaffolding, skinned with corrugated iron, with a huge double-gabled roof topped by a distinctive onion dome. The 106sqm stage stretches out into the yard and thanks to the original design of the theatre, wherever audience members sit or stand, they are never more than 15 metres from the stage. By working with international experts in Shakespearean performance, Pop-up Globe recreates as accurately as possible the actual performance conditions of the second Globe theatre: live music and dance, ferocious fight sequences and spectacular effects, and direct address. The theatre is completely unamplified, just as it was in 1614. Every performance ends with a rousing jig regardless of the genre of the play. The house lights remain on during evening performances, meaning the actors and audience always share the same space and experience – audience interaction is a vital part of the show. Indeed it is one of the highlights of the whole theatre experience. 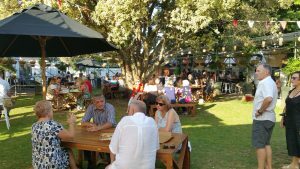 You can start the theatre experience by having dinner and a wine or three in the garden bar. What a great way to enjoy a warm summer’s eve before seeing Hamlet or Measure for Measure – the two plays being performed in February and March. If nothing else it’s a wonderful people-watching opportunity. Informality is very much part of the show. Before the play starts the actors are on stage warming up, getting costume fittings, chatting with friends in the audience.